In this post, we’ll create a drop-down that contains a unique list of choices derived from a column that contains duplicate values. This may sound familiar as we previously accomplished this with a PivotTable. However, the Power Query feature that’s built-in to Excel 2016 makes this process easier. 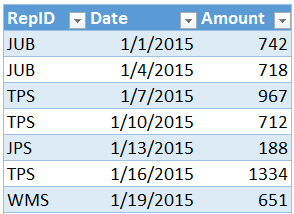 We have a data table that contains RepID, Date, and Amount columns, as shown below. On another sheet, we want the user to be able to select a rep from a drop-down. We want the drop-down list to contain a unique list of reps from the table. Our solution should be fast and easy to maintain over time, even when new reps may appear in the data table. We don’t want to use VBA or to have to update any formulas going forward. Let’s see how Power Query can help. Please note that the steps below are written with Excel 2016 for Windows. If you are using a different version of Excel, Power Query may not be available or you may need to download the free Power Query Add-In. First, we navigate to the worksheet that contains our data table, shown below. This launches the Query Editor dialog, as shown below. The results we want to return should be the RepID column, without duplicates, sorted in ascending order. So, let’s begin by removing the other columns. Finally, we sort the list in ascending order by using the RepID drop-down. The updated query is shown below. Last, we need to return the results to Excel, so we use the Close & Load command. Our unique RepID list now appears in a table in our workbook, as shown below. We are mostly done at this point, and all that remains is to use this list of choices in our drop-down. We need to create a name that refers to the table that stores the query results. There are a couple of options for accomplishing this step. One option is to select all of the data cells in the table, and then enter the desired name into the Name Box (that little box just to the left of the formula bar). In the Name Manager dialog, we click the New button to create a new name. We enter the desired name, such as RepList. In the Refers to field, we enter an equal sign and then the table’s name, such as =Table1_2. This is shown below. We click OK and now that our new name is created, we can set up the drop-down. In the Data Validation dialog, we want to Allow a List. The Source is equal to our name =RepList, as shown below. When we click OK, Excel inserts the drop-down, and now we can pick from our list of choices. Whenever we update the table with new transactions, all we need to do is right-click our results table and select Refresh. 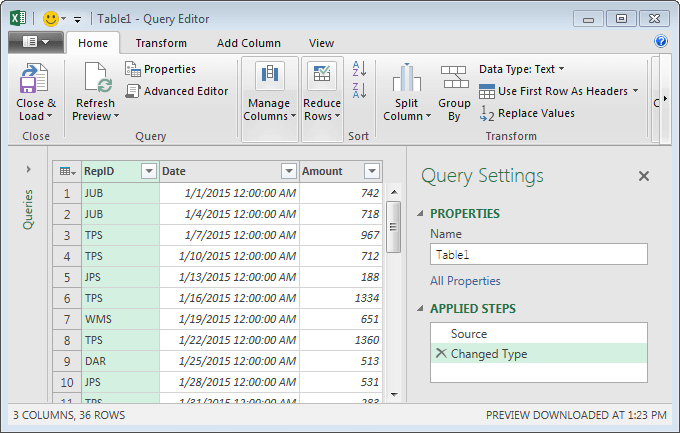 Power Query will rebuild the results table, and the values will automatically flow into the drop-down list. If you have any other fun Power Query ideas, please share by posting a comment below…thanks! This would be useful. Wish it was in Excel 2010. How could make multiple drop-down lists that relate to each other so they don’t duplicate selections? For example, if I have a list of tasks with drop boxes containing employee names, how do I prevent the same employee from being selected for multiple tasks? I’m addicted to your Blog! Keep them coming please! I have a question! How do you make a drop down list change formatting on another cell. For example say I have a drop down box of USD and Euro for currency. Then in another column right next to it you want that currency to change with the change of the drop down box. How would you do that? Can you even do that? Yes:) You can do that using conditional formatting. Use this blog https://www.excel-university.com/excel-conditional-formatting-based-on-another-cell/ from Mr. Jeff, and when you add your own formatting, you can change the number formatting of the cell with the left-most tab. Write your formula and format the number based on the selection. This is ok, but what if I want to create four dependent unique DV lists for filtering table by first DV or 3rd DV or all four DVs ?